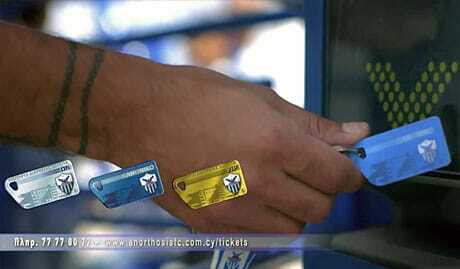 PARTNER NEWS: Season ticket holders at a Cypriot first division football club will soon get into the team’s Antonis Papadopoulos Stadium on match day by tapping contactless keyfobs — or wristbands for younger supporters — against NFC turnstiles at the entrance. Anorthosis Famagusta FC has been working with tag supplier RapidNFC to deliver the service, which is expected to be in place for the 2015/16 season. Although initially only being used for entry to the matches, the contactless keyfobs and wristbands could later be used for marketing purposes, RapidNFC says. “Through this marketing a club could increase website traffic and merchandise sales, provide supporters with special offers, keep fans informed of all latest club developments and create a way for the club to be more interactive with their fans in general,” the company explains. “Besides being a hi-tech solution for entry to football games, it is also a lot more convenient than a standard ticket. “Rather than using normal paper tickets that you would usually have for a season ticket, perhaps with a barcode for entry, they’ve switched so they don’t do any paper tickets anymore for season ticket holders,” RapidNFC’s Jack Sage told NFC World. “When they go to the stadium, they literally just tap in. “The club provided the graphics and we manufactured the whole products, the wristbands and the keycards; the software and the design of the products came from the football team.